With the imminent arrival of a new Bridget Jones novel, some of the papers have been dusting off the old David Willetts comment about how the Tories needed to pass the Bridget Jones test to prove that they'd decontaminated the brand. Which seems like an ideal opportunity to mention a piece I wrote last week for the Waterstones blog about how deeply loathed the Tories were in the 1990s world depicted by Helen Fielding and Nick Hornby. There was a time, when David Cameron was still leader of the opposition, when he could probably have won Bridget over. Now, I doubt it somehow. We seem a long way from the days of hug-a-husky. There's also a piece by me that I don't think I've mentioned before in the Yorkshire Post, intended to mark the 21st anniversary of Black Wednesday. Valancourt Books are a very fine American publishing house who specialise in reprinting classic and lost novels. 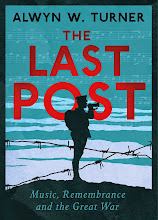 Rather wonderfully, they've acquired the rights to republish three novels by the great Gillian Freeman and - even better - have invited me to write an introduction to one of them. I first read The Leader back in the 1970s - a decade or so after it was written - and I've loved it ever since. I also try to promote it whenever I can, so it turns up on my Trash Fiction site, gets mentioned in a couple of my books and frequently appears in lectures. 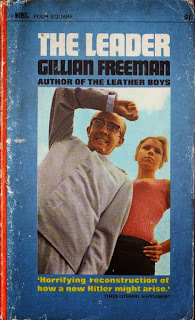 So I'm thrilled to be asked to write a few words to accompany Ms Freeman's work. My thanks to James D. Jenkins for the invitation. I have to record the news that Harry Goodwin has died. Harry was the resident photographer on Top of the Pops for the first decade of that programme, from 1964 to 1973. 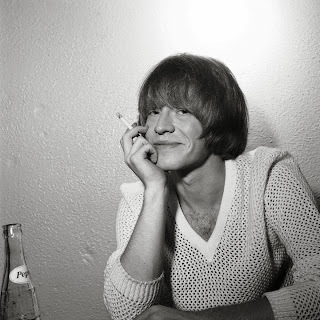 Since his job was to shoot everyone who appeared on the show, and since that meant virtually everyone in British and American pop music (with the exception of Elvis), he ended up with a portfolio that was probably unique in its breadth, covering everyone from the Beatles to Bowie, Jimi Hendrix to the Jackson Five. I worked with Harry on My Generation, a book of his photos published to accompany an exhibition of his work at the V&A. The main problem we had was his reluctance to let me use some of his better stories about Top of the Pops - he could be infuriatingly discreet. In due course, the tales will no doubt emerge. Like I say, it's still a rewarding read. 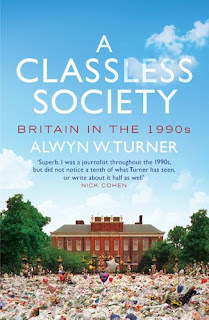 So obviously I'm pleased that Dan has written a review for Lobster magazine of my most recent book, A Classless Society. Well, not simply a review, more like a rather splendid essay on the 1990s. Happily for me, he likes the book, but adds some typically good stuff of his own, including a fabulous comment from Douglas Jay on John Major: 'The Conservatives have found their Attlee.' I wish I'd known that quote when writing. My thanks to Dan for his kind words and for continuing to be a source of inspiration. I should also note that his always excellent blog has moved address and can now be found here. 'No return to boom and bust.' - Kenneth Clarke, Conservative chancellor of the exchequer, 1995. 'The real complacency is promising to end boom and bust.' - David Cameron, Conservative prime minister, 2013. Of all the programmes taking a lightly satirical look at the week's news, the one I always had a fondness for was The Treatment on Radio Five Live, presented by Stuart Maconie in the late-1990s. I liked it enough that I went to a recording to celebrate my birthday one year. So I was a little saddened when Maconie gave my book, A Classless Society, a less-than-enthusiastic review in the New Statesman. That's just wonderful. I'm extremely grateful to Mr Welsh and to whoever at the Telegraph had the inspired idea of asking him to review the book. So the current score amongst critics is 10-2: Craig Brown, Anthony Cummins, Matthew Engel, Roger Lewis, Andrew Neather, Richard Ryder, Dominic Sandbrook, David Stenhouse, Irvine Welsh and The Economist in favour; David Aaronovitch and Stuart Maconie against. I think that's a points victory at least. 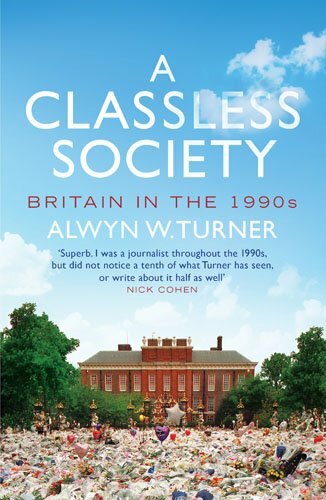 Tomorrow is the official publication date for A Classless Society. In fact, of course, it's been available for a couple of weeks now, rushed forward in response to the first reviews. A couple of those reviews have said that I take too parochial a view, that I'm overly focussed on Britain. Which is certainly true, but then the subtitle of the book is Britain in the 1990s, which kind of gives the game away. There is a chapter on foreign policy and one on Europe (a theme which runs through much of the rest as well), but the emphasis is very definitely on the home front. That's what interests me. But Aaronovitch is wrong. The biggest groups of the decade (in Britain) were Take That and the Spice Girls, Blur, Oasis and Radiohead. The most watched TV shows remained EastEnders and Coronation Street, alongside The Darling Buds of May and One Foot in the Grave. Even the British film industry came up with Four Weddings and a Funeral, The Full Monty and Trainspotting, all of which did remarkably good business at the box-office. Of course they didn't eclipse the takings of Titanic, but even I would struggle to find anything to say about Titanic, except that it confirms what we've always known - that people like a massive disaster movie, particularly if it's got a romantic subject. The point of cultural history is not simply to list what was big and successful; that's what reference books are for. It's to understand how popular culture reflects and shapes society. That means that a premium is bound to be placed on home-grown products, unless they seem to represent a wider trend: Dallas and Dynasty, say, or the films of Stallone and Schwarzenegger in the 1980s. One other complaint that has surfaced is the lack of space accorded to the internet. There might be some truth in this, but I think it's worth remembering that I end my account in the middle of 2001. The internet was then by no means universal, and most of those British homes that were connected to what some were still calling the information superhighway relied on dial-up modems. This was before the launch, for example, of MySpace (2003), Facebook (2004) and Twitter (2006). Most of those off-line companies that had an internet presence had little or no idea what to do with their sites - they just felt they ought to have them. It was clear that the internet was going to change things, possibly in a way not seen since the invention of printing, but it was far from obvious how this would manifest itself. Indeed, I think it's still far too early to say. So I mention the internet as a looming presence on the horizon, but since my (self-appointed) brief is to document how things seemed at the time, it's not much more than that. The one place where the internet was a really serious issue was in the world of the news media, which were both enthusiastic about the new medium and fearful of what it might bring. I wonder whether those reviewers who identify my lack of coverage have a slightly distorted perception of its scale in 1990s Britain because they were working in an industry that was so closely affected. Whilst writing about the reviews thus far, I ought to thank a couple of reviewers who have contacted me personally. Richard Ryder very courteously wrote to explain that his review had been subbed and his good words about the book had been lost. Matthew Engel wrote to point out some errors that had crept in. I'd wrongly referred to Alan Clark's wife as Anne rather than Jane, and talked about Lord Salisbury in 1812 instead of Lord Liverpool (well, you've seen one cathedral city...) - these will be changed in subsequent editions. But mostly I want to thank all those who have been kind enough to read the book and review it. It's had more widespread coverage than I've ever received before, and for that I am deeply indebted to Jessica Axe at Aurum, who has been absolutely splendid and tireless.